Persistence Market Research examines the performance of the global cardiovascular information system market for a period of eight years in a new report titled “Cardiovascular Information System Market: Global Industry Analysis and Forecast, 2016-2024.” According to the report, key players in the global cardiovascular information system market are focusing on the development of new solutions that can solve interoperability issues faced by healthcare settings. The integration level of cardiovascular information systems is gradually expanding from inter-departments to image sharing between hospitals. Market players are also collaborating with national regulatory bodies to implement cloud based registries so as to collate all patient related data. This Persistence Market Research report examines the global cardiovascular information system market for the period 2016–2024. The primary objective of the report is to offer insights into developments in the global cardiovascular information system market that are effecting the global businesses and enterprises. The cardiovascular information system market is substantially driven by increasing healthcare costs and the need for data interoperability across electronic record systems. The increasing government grants to form new data centers to integrate all the available healthcare data has necessitated the need to implement cardiovascular information systems. This report covers the global cardiovascular information system market performance in terms of revenue contribution from various segments. The report also includes Persistence Market Research’s analysis of key trends, drivers, restraints and opportunities, which are influencing the growth of the global cardiovascular information system market. Impact analysis of key growth drivers and restraints are included in this report to better equip clients with crystal clear decision-making insights. The global cardiovascular information system market report begins with an overview of cardiovascular information systems and key market definitions. 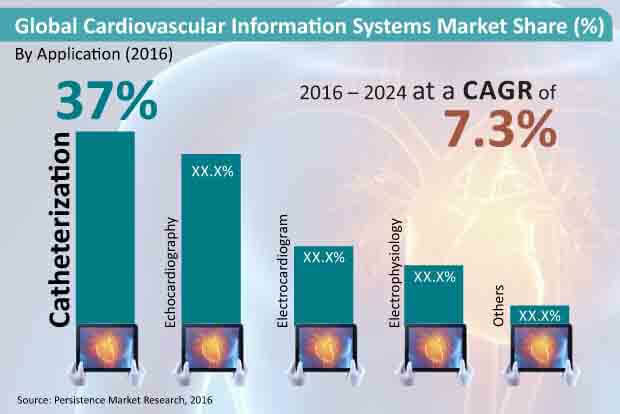 This section also underlines factors influencing the growth of the global cardiovascular information system market along with a detailing of the key trends, drivers, restraints, and opportunities. Key region-specific trends are included in report to better equip clients with information and hidden insights. Distinguishing features of the report include integrating cath labs to cardiovascular information systems, Meaningful Use incentives and a wide range of functionalities. The next section of the report highlights the region wise growth trends of the global cardiovascular information system market. It provides a market outlook for 2015–2024 and sets the forecast within the context of the global cardiovascular information system market. The study discusses key regional trends contributing to the growth of the cardiovascular information system market worldwide, as well as analyses the extent to which drivers are influencing this market in each region. Key regions assessed in this report include North America, Latin America, Europe, Asia Pacific and Middle East & Africa. In the final section of the report on the global cardiovascular information system market, a ‘Competitive Landscape’ is included to provide report audiences with a dashboard view to access the key differentiators among the various competitor firms. Detailed company profiles presented in this section include company-specific long-term and short-term strategies, key offerings and recent developments in the global cardiovascular information system market. To offer an accurate forecast for the market numbers, the report starts by sizing up the current market, which forms the basis of how the global cardiovascular information system market is expected to develop in the future. Given the characteristics of the market, the report triangulates the outcome of three different types of analysis based on the supply side, downstream industry demand, and the economic envelope. In addition, it is imperative to note that in an ever-fluctuating global economy, the report not only conducts forecasts in terms of CAGR, but also analyzes the market based on key parameters such as year-on-year (Y-o-Y) growth rates to understand the predictability of the market and to identify the right opportunities across the market. Another important feature of this report is the analysis of key market segments in terms of absolute dollar opportunity, critical in assessing the level of opportunity that a provider can look to achieve, as well as to identify potential resources from a service perspective in the global cardiovascular information system market. Cardiovascular diseases are the leading cause of death worldwide where in one in three people die each year due to heart disease. According to the CDC foundation 2015 data, approximately 800,000 Americans die due to stroke and other cardiovascular diseases. This has in turn increased the number of imaging systems and the need for centralized data sharing units. The government reforms and incentives to promote the adoption of electronic medical records has propelled the market for Cardiovascular Information Systems (CVIS). CVIS is more data driven as compared to CPAPS where patient informatics from integrated Hemodynamics systems, Echo machines, EKG/ECG carts and third-party integrated monitoring systems are all stored within the single CVIS database for patient records and reporting. CVIS has the ability to provide dynamic reporting i.e. images, informatics, measurements, etc. that are structured in a template-type format for efficiency and consistent delivery of patient reports. Persistence Market Research forecasts the global cardiovascular information system market to grow from more than US$ 650 Mn in 2015 to nearly US$ 1,300 Mn by 2024 end. This represents a CAGR of 7.3% over the forecast period. The global market for cardiovascular information systems represents an absolute $ opportunity of more than US$ 45 Mn in 2017 over 2016 and incremental opportunity of more than US$ 600 Mn between 2016 and 2024. Catheterization segment dominated the global CVIS market in revenue terms in 2015 and is projected to continue to do so throughout the forecast period. Catheterization segment is the most attractive segment, with an attractiveness index of 1.8 during the forecast period. Catheterization segment accounted for 37.3% value share in 2015 and is projected to account for 37.1% share by 2024 end. Echocardiography segment is expected to be the second most lucrative segment in the global CVIS market, with an attractiveness index of 1.7 during the forecast period. Electrocardiogram segment is expected to be the least attractive segment in the global CVIS market, with an attractiveness index of 0.7 during the forecast period. The type of procedures performed in cardiac cath labs have changed with time and have become more complex – Transcatheter aortic valve replacement (TAVR), transcatheter structural heart repairs such as patent foramen ovale, ventricular septal defects, renal denervation to treat drug-resistant hypertension and left atrial appendage. Some procedures, especially hybrid coronary revascularizations and TAVR, combined with healthcare reforms, will require new levels of collaboration between various specialists such as surgeons and interventionists. There is a complete transformation and cath labs would no longer be serving cardiologists but many other end users. Geographically, North America is the leading the global CVIS market. North America dominated the global CVIS market as the region’s healthcare information system (HIT) is experiencing acquisition and federal implementation of Meaningful Use (MU) incentive program as well as other federal mandates such as ICD-10 coding conversion. The number of HIT vendors are also increasing as there are many niche market players trying to leverage the MU mandate. As economically developing regions such as Latin America are still behind the developed countries, this region has huge potential for market growth, and is likely to be the fastest growing region throughout the forecast period.